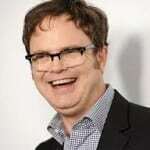 Rainn Wilson, one of the stars of NBC's "The Office," relished his recent Twitter tirade against US Airways, which stranded him and his "Office" castmates in Philadelphia. Apparently, their May 3 connecting flight from Philadelphia to Scranton, Pa., left earlier than scheduled, forcing them to drive rental cars to the series' wrap party. The episode sparked a series of furious tweets: "So @USAirways just screwed me & half the cast of The Office. Conctng flight left BEFORE departure time. Sorry Scranton won't see u til tom." US Airways was quick to respond, but came off as tone deaf. Wilson was engraged, and this tweet from the airline didn't help: "Rainn, I'm sorry to hear this. I can put you on the next flt available. Plz follow & DM if you'd like me to assist. Thanks!" It seems that Wilson wanted US Airways to apologize for leaving before the scheduled time, rather than saying it was "sorry to hear" about the problem. The perfunctory "Thanks!" just added jet fuel to the fire. This may have been a case in which nothing US Airways could have said or done would have stopped the flow of mockery from the comic actor, who has 3.6 million followers on Twitter. Don't attempt to take the conversation to direct messaging: Assume that the celebrity will turn around and publish the DM tweets anyway—which is exactly what Wilson did. Don't feel their pain by being overly empathetic: US Airways didn't come off any better by "understanding" his frustration. Address the real issue directly if at all possible: US Airways did not admit or deny in its tweets that Wilson's flight left earlier than scheduled. Limit tweets to no more than two in response to an angry celebrity: It's the only way to avoid becoming a public punching bag. Amy O'Brien, senior analyst, social media, for American Airlines (which is merging with US Airways) will be sharing best practices on managing a crisis on social channels and measuring the effectiveness of your strategy at PR News' Measurement Conference on May 15 at the National Press Club in Washington, D.C. I work in public service and it seems that reaction to complaints should be the same for celebrities as it is for everyone else. One disturbing aspect of Twitter is when a celebrity, with a passionate fan following, complains about a specific employee, gives the employee’s name, where they work and who they work for, opening that person up to harrassment and threats of violence. I saw this recently and was amazed that this poor behavior wasn’t called out in the media. Well it’s Dwight Schrute after all!